Depending on the methods of counting, as many as three hundred versions of the Indian epic poem, the Ramayana, are known to exist. The oldest version is generally recognized to be the Sanskrit version attributed to the sage Valmiki. The Ramayana has spread to many Asian countries outside of India, including Burma, Indonesia, Cambodia, Laos, Philippines, Sri Lanka, Nepal, Thailand, Malaysia, Japan, Mongolia, Vietnam and China. The original Valmiki version has been adapted or translated into various regional languages, which have often been marked more or less by plot twists and thematic adaptations. Some of the important adaptations of the classic tale include the 12th-century Tamil language Ramavataram, 14th-century Telugu language Sri Ranganatha Ramayanam, the Khmer Reamker, the Old Javanese Kakawin Ramayana, and the Thai Ramakien, the Lao Phra Lak Phra Lam, and the Burmese Yama Zatdaw. The manifestation of the core themes of the original Ramayana is far broader even than can be understood from a consideration of the different languages in which it appears, as its essence has been expressed in a diverse array of regional cultures and artistic mediums. For instance, the Ramayana has been expressed or interpreted in Lkhaon Khmer dance theatre, in the Mappila Songs of the Muslims of Kerala and Lakshadweep, in the Indian operatic tradition of Yakshagana, and in the epic paintings still extant on, for instance, the walls of Thailand's Wat Phra Kaew palace temple. In Indonesia, the tales of the Ramayana appear reflected in ballet performances, masked danced drama, and Wayang shadow puppetry. Angkor Wat in Siem Reap also has mural scenes from the epic Battle of Lanka on one of its outer walls. Adhyatma Ramayana or spiritual Ramayana is extracted from the Brahmananda Purana, traditionally ascribed to Vyasa. It is thought to be the inspiration for Tulsidas’ Ramcharitmanas in Awadhi. While the Valmiki Ramayana emphasizes Rama’s human nature, the Adhyatam Ramayana tells the story from the perspective of his divinity. It is organized into seven Kandas, parallel to Valmiki’s. Vasistha Ramayana (more commonly known as Yoga Vasistha) is traditionally attributed to Valmiki. It is principally a dialogue between Vasistha and Rama in which Vasistha advances many of the principle tenets of Advaita Vedanta. It includes many anecdotes and illustrative stories, but does not recount Valmiki’s story of Rama in detail. Laghu Yoga Vasishtha, by Abhinanda of Kashmir, is an abbreviated version of the Yoga Vasistha. Ananda Ramayana is traditionally attributed to Valmiki. While it briefly recounts the traditional story of Rama, it is composed primarily of stories peripheral, though related, to Valmiki’s narrative. These include Ravana’s abduction of Sita and Rama’s installment of the Shiva Lingam at Rameswaram. Agastya Ramayana is also traditionally attributed to Agastya. 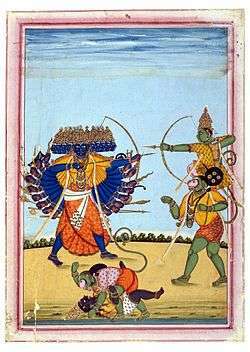 Adbhuta Ramayana, traditionally attributed to Valmiki, includes related stories of Rama. Its emphasis is on the role of Sita, and includes an expanded story of the circumstances of her birth as well as an account of her defeat of Ravana's older brother, also known as Ravana but with 1000 heads. The Ramayana story is also recounted within other Sanskrit texts, including: the Mahabharata (in the Ramokhyana Parva of the Vana Parva); Bhagavata Purana contains a concise account of Rama’s story in its ninth skandha; brief versions also appear in the Vishnu Purana as well as in the Agni Purana. An eleventh-century Sanskrit play entitled Mahanataka by Hanumat relates the story of Rama in nine, ten, or fourteen acts, depending on recension. A sixth-century manuscript Dasa Griba Rakshash Charitram Vadha contains five kandas: Balakanda and Uttarakanda are missing. This version portrays Rama as more of a human than god. Rama is shown about to offer his eyes to make up the full number - 108 - of lotus blossoms needed in the puja that he must offer to the goddess Durga to gain her blessing. Scene from Krittivasi Ramayan. 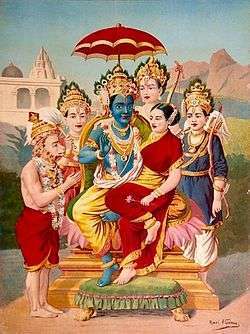 Andhra Pradesh - The Sri Ranganatha Ramayanam was adapted by Gona Budda Reddy and is the Telugu version of the Ramayana. The Molla Ramayanamu was adapted by poet Molla. The most extensive work in Telugu is that of Sri Viswanadha Satyanarayana, Srimadramayana Kalpavriksham. This is perhaps a free re-telling of the Valmiki Ramayana. It was awarded the first jnanpith award in Telugu, for the poet who was later accaimed as the Kavi Samrat. Karnataka - The Kannada versions of the Ramayana – the Kumudendu Ramayana(a Jain version), written in the 13th century and the Kumara-Valmiki Torave Ramayana, written in the 16th century. There is another version titled Ramachandra Charita Purana written by Nagachandra during the 13th century. Assam - Saptakanda Ramayana, The Assamese Katha Ramayana or Kotha Ramayana in the 14th century by Madhava Kandali. Bengal - The Bengali Krittivasi Ramayan written by Krittibas Ojha in the 15th century. Goa - Ramayanu written by Krishnadasa Shama in the 15th century in Kardalipura, Goa in Konkani, manuscripts found in Portugal. Kerala - The Malayalam language Kannassa Ramayanam written by Niranam Rama Panicker in the 16th century, Adhyatma Ramayanam Kilipattu written by Thunchaththu Ezhuthachan in the 16th century and "Mappila Ramayanam." among the Muslims. Gujarat - The Tulsi-Krta Ramayana is a Gujarati adaptation of Tulsidas' Ramcharitamanas in the 17th century, by the poet Premanand Swami. Urdu version called the Pothi Ramayana was written in the 17th century. Jammu and Kashmir - The Kashmiri Ramavatara Charita was written in the 19th century. Kannada - Two prose works by Nanadalike Lakshminarayana ('Muddanna') entitled Adbhuta Ramayana (1895) and Ramaswamedham (1898). Buddhism - Dasarata Jataka. This version is notable for depicting Rama and Sita as siblings who marry. Such sibling marriages are a common symbolic imagery in early Buddhist literature to denote purity of a dynasty. As the Buddha is supposed to have come from the Ikshvaku clan (of Rama) this symbolised his dynastic merits. Jain - Paumachariyam, the most influent among the Jain versions is written as a polemic against Sanskrit versions asserting that all characters in the Ramayana were mere mortals who engaged in conflict over moral issues. The only superhuman feat mentioned is Ravana's ability to fly through the clouds (meghavahana). All characters are depicted as Jains and the Rama, Sita and Lakshmana visit Jain pilgrimage sites rather than ashrams (as in Valmiki ramayana) during their stay in the forest. Champu Ramayana, Ananda Rayamana, Mantra Ramayana, Giridhara Ramayana, Shree Ramayana mangeri, Shree Ranganatha Ramayana, Bhaskara Ramayana, Gobinda Ramayana written by Guru Gobind Singhji, in samvat 1655, Radhey Shyam Ramayana. Nepal - The Nepal Bhasa version called Siddhi Ramayan was written by Mahakavi Siddhidas Mahaju Amatya during Nepal Bhasa renaissance era and the Khas language (later called "Nepali") version of Bhanubhaktako Ramayan by Bhanubhakta Acharya marked the first epic written in the language. Contemporary prose versions of the epic Ramayana include Sri Ramayana Darshanam by Dr. K. V. Puttappa in Kannada and Ramayana Kalpavrikshamu by Viswanatha Satyanarayana in Telugu, both of which have been awarded the Jnanpith Award. A prose version called Geet Ramayan in Marathi by G.D. Madgulkar was rendered in music by Sudhir Phadke and is considered to be a masterpiece of Marathi literature. The popular Indian author R. K. Narayan wrote a shortened prose interpretation of the epic. In addition, Ramesh Menon wrote a single-volume edition of the Ramayana, which has received praise from scholars. A short version with a somewhat contemporary feel, influenced, according to the author, by contemporary representations of guerrilla warfare, appeared in Martin Buckley's Ramayana-based travelogue, An Indian Odyssey (Random House London, 2008). C Rajgopalachari, India's only Indian Governor General, also wrote a single volume Ramayana, published by Bhavans in 1957. In September 2006, the first issue of Ramayan 3392 A.D. was published by Virgin Comics, featuring the Ramayana as re-envisioned by author Deepak Chopra and filmmaker Shekhar Kapur. Most recently, popular Indian author Ashok Banker, authored an eight-volume imaginative retelling based on the Ramayana which found considerable success and was credited with ushering in a new wave of interest in the epic as well as other mythological retellings. Banker's version took considerable liberties with the original Sanskrit epic yet found critical acclaim. It is claimed to be the most popular retelling of the epic currently. The latest in the retelling of the epic is from Ravi Venugopal, an US based NRI narrating the story from the eyes of Rama. The first volume is I, Rama trilogy is Age of Seers and it talks about an age old Rama who introspects his life and the events happening with a pragmatic view. The book is the first of its kind and stuns the reader with new perspectives of several characters. The book tries to give a scientific lift to the ancient epic. The Ramayana has been adapted on screen as well, most notably as the television series Ramayan by producer Ramanand Sagar, which is based primarily on the Ramcharitmanas and Valmiki's Ramayana and, at the time, was the most popular series in Indian television history. In the late 1990s, Sanjay Khan made a series called Jai Hanuman, recounting tales from the life of Hanuman and related characters from the Ramayana. A Japanese animated film called Ramayana: The Legend of Prince Rama was released in the early 1990s. US animation artist Nina Paley retold the Ramayana from Sita's point of view (with a secondary story about Paley's own marriage) in the animated musical Sita Sings the Blues. An Indian animated film called Ramayana: The Epic was released in October 2010. The Stories Without Borders Production Company has a documentary in production about different versions of the Ramayana and a second India epic, the Mahabharata, across South and Southeast Asia that is slated to film begin filming in 2014. In 2015,star plus hosted Siya ke Ram,a retelling of Ramayana from Sita's POV. Starting in 1978, and under the supervision of Baba Hari Dass, the Ramayana has been performed every year by Mount Madonna School in Watsonville, California. Currently, it is the largest yearly, Western version of the epic being performed. It takes the form of a colorful musical with custom costumes, sung and spoken dialog, jazz-rock orchestration and dance. This performance takes place in a large audience theater setting usually in June, in San Jose, CA. Baba Hari Dass has thought acting arts, costume-attire design, masks making, and choreography to bring alive characters of Sri Ram, Sita, Hanuman, Lakshmana, Shiva, Parvati, Vibhishan, Jatayu, Sugriva, Surpanakha, Ravana and his rakshasa court, Meghnaad, Kumbhakarna, and the army of monkeys and demons. Late Tamil Actor R. S. Manohar played Ravana as the Antagonist in his Magnum Opus Lankeswaran, in which he projects the heroic and better side of Ravana. It was staged more than 1,800 times. Artist Vikas Goel and writer Vijayendra Mohanty have created a ten-part comic series called Ravanayan that presents the story of Ramayana from Ravana's perspective. Following the success of Ashok Banker's Ramayana Series retellings, a graphic novel adaptation was released in 2010. ↑ Camille Bulcke, Ramkatha: Utpatti aur Vikās (The Rāma story: Original and development), Prayāg: Hindī Pariṣad Prakāśan, 1950. ↑ A. K. Ramanujan, "Three hundred Rāmāyaṇas: Five Examples and Three Thoughts on Translation", in Paula Richman (ed. ), Many Rāmāyaṇas: The Diversity of a Narrative Tradition in South Asia, Berkeley, California: University of California Press, 1991, p. 48, note 3. ↑ "Ramayana(s) retold in Asia". The Hindu. 19 February 2012. Retrieved 2015-02-07. ↑ "History of Rama and Ramayan". Hindu Online. 2010. Retrieved 2015-02-07. ↑ "A different song". The Hindu. 12 August 2005. Retrieved 2009-05-21. ↑ "Archived copy". Archived from the original on 9 October 2009. Retrieved 13 December 2009. ↑ Leslie, Julia (2003). Authority and meaning in Indian religions: Hinduism and the case of Vālmīki. Ashgate Publishing, Ltd.. ISBN 0-7546-3431-0. ↑ Ananda Ramayana. Parimal Publications. 2006. ↑ Mahabharata. Parimal Publications. 2006. ↑ Srimad Bhagavata Mahapurana. Gita Press, Gorakhpur. ISBN 81-293-0155-5. ↑ Schuyler, Montgomery (1877). A bibliography of the Sanskrit drama: with an introductory sketch of the dramatic literature of India. Columbia University Press, the Macmillan Company, agents. ↑ Jhimli Mukherjee Pandey (18 December 2015). "6th-century Ramayana found in Kolkata, stuns scholars". The Times of India. ↑ de Jong, J.W. 1971. ‘Un fragment de l’histoire de Rāma en tibétain’ in Études tibétaines dédiées à la mémoire de Marcelle Lalou. Paris: Librairie d’Amérique et d’Orient; de Jong, J.W. 1977. The Tun-huang Manuscripts of the Tibetan Ramayana Story’, Indo-Iranian Journal 19:37-88, 1977; Thomas, F.W. 1929. ‘A Rāmāyaṇa Story in Tibetan from Chinese Turkestan’ in Indian Studies in Honor of Charles Rockwell Lanman: 193–212. Cambridge, Mass: Harvard University Press. ↑ website editor (June 6–8, 2014). "Ramayana". 36th Annual Ramayana!. Mount Madonna School. Retrieved Aug 8, 2014. ↑ Jha, Ritu (July 8, 2011). "California school celebrates Ramayan for 33 years". rediff News,. rediff.com. Retrieved Aug 3, 2014. ↑ "Superstar of Tamil theatre". October 2, 2000. ↑ Banerjee, Manali (2011-07-09). "The Ramayana as Ravana saw it". Hindustan Times. New Delhi: HT Media. Retrieved 2011-07-23. Many Ramayanas: The Diversity of a Narrative Tradition in South Asia, ed. by Paula Richman. University of California Press, 1991.